At the front of the Music Box there are 2 rows of 4 pins, with symbols next to them indicating “facing forward” and “facing backwards”. The outer 2 pins of each 4 are power and ground and the inner two pins are Data in and data out. The row of pins nearest the edge of the board (facing outward) are the first neopixels in the chain. The data out from these, goes to the data in of the 4 pins facing into the board. This means you can put one plugin facing outwards and one facing inwards. The plugin facing inwards would start at LED10 (assuming a standard 10 neopixel plugin is in the first position). If you only have an inward facing plugin, you must link the data in and data out of the outward facing pins. This is why there is a little back jumper included. If you only have a plugin facing outward, then you don’t need the little jumper, but you can keep it safe by plugging it into the inward facing pins. Plug your selected plugin (Santa or Christmas tree for now) into the 4 pins nearest the edge of the board. the LED marked 0 at the bottom is the first LED in the chain of neopixels. 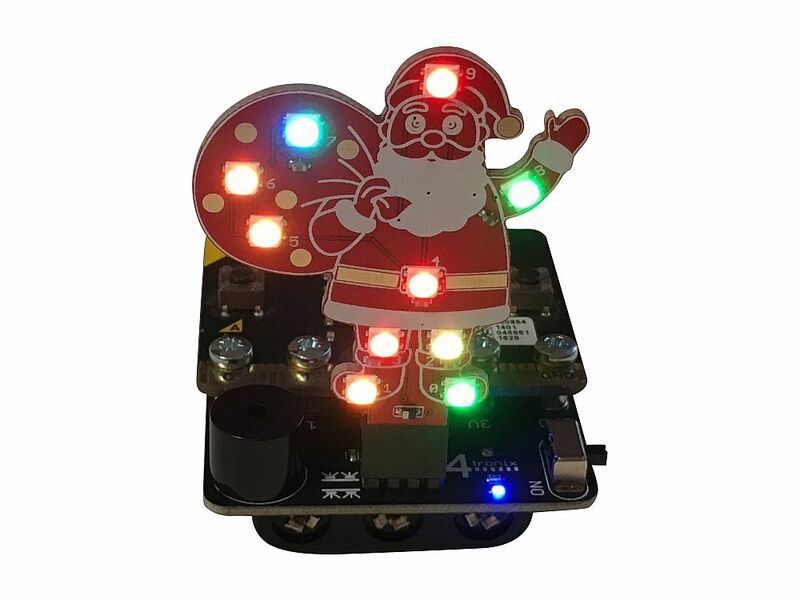 Now you can use the standard neopixel modules in your selected MicroBit language. Don’t forget to include the ‘show’ block after you have changed the pixel colours. It doesn’t actually update the pixels themselves until you do. You will also find that the LEDs will light up even if the Music:Box is not switched on. However, the colours won’t be correct and it will generally be quite dim. Always switch on the Music:Box when testing LEDs.